Our spaces are the perfect places to hold any event. 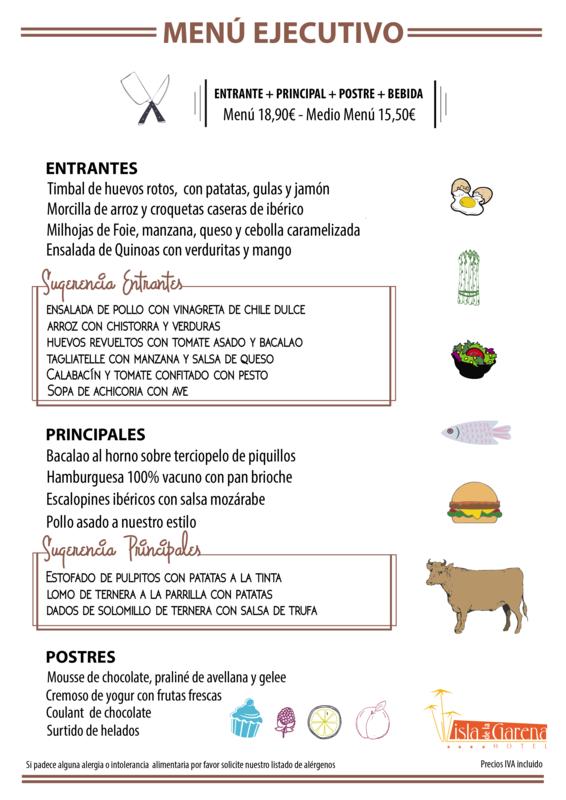 From July 15 to September 2, the restaurant will remain closed, but we have available a daily menu in the cafeteria. The Hotel Restaurant Isla de la Garena is open to the public and offers you the possibility to enjoy an excellent daily gastronomic offer in a quiet, modern and functional environment, at very affordable prices. We have a daily menu that changes according to the season and integrates the creations of our chef, who combines national and international cuisine. For more formal meals, we offer a menu with varied dishes, starters, top quality meats and fish of the day. In addition, we offer our guests free parking. Check out our daily menu. The cafeteria of our hotel has recently reinvented itself to renew its proposals and get surprised. In our elaborate menu of premium gintonics and coffee we offer you a series of perfect suggestions to enjoy the tradition of pecking and rations.We especially recommend dishes such as the complete hamburger, the chicken strips with barbecue sauce, the eggs with gulas and crispy Iberian. We also have lighter but equally tasty choices in our selection of salads.